This posting was "Simply the best...because it's the first blog entry I've actually tried to make interesting." The sentence above is a requirement for the contest. I'll leave it up to you to judge whether the posting was interesting or not. Now I'm supposed to link back to the post on Proper Course entitled, "Simply the best..."
There, done. Now got to get ready for New Year's trip to Tokyo. Unfortunately it's aboard an All Nippon Airways jet and not Scarlette. We leave tomorrow with the three boys in tow to the mainland of The Rising Sun. Cap'n J and Kenny Yergler sport Santa hats off the coast of Cape Zanpa in Okinawa on Christmas Eve. SOUTH CHINA SEA (12/24/08) -- I spent Christmas Eve off the coast of Okinawa skippering Scarlette, my 24-foot sailboat with co-worker/deckhand/helmsman Kenny Yergler. Man, can my life get any worse? Our trip went almost as planned. Originally scheduled for Monday (Dec. 22), the Christmas Eve trip was our last window of the year to sail as I'm headed off on family vacation on Sunday Dec. 28 to Tokyo for New Year's celebrations. Monday's weather was rife with wind. So, we agreed to go on Wednesday -- Christmas Eve. We met at the Kadena Marina at 8 a.m. got Scarlette, a J/24 sailboat made in 1985, ready to launch. Although the skies were pretty much overcast we both splashed a little sunscreen on just in case. My nose -- like Rudolph -- was a little red later on so putting sunscreen on was a good idea. We headed out of Kadena Marina at 8:44 a.m.
High tide this morning was at 6:01 a.m. and we discussed a little how the low tide -- scheduled for 11:12 a.m. -- was going to possibly affect our ability to get close to the cliffs at Cape Zanpa and Maeda Point. Helmsman Kenny Yergler looks almost as if he's single-handing Scarlette as we headed north up the west coast of Okinawa. As we motored out of Kadena Marina we had very little wind as we hoisted sails and headed north up the west coast of Okinawa on the South China Sea. We kept the Yamaha 5 horsepower purring as we approached a set of stationary fishing nets off the coast of Torii Beach. This is a stationary hazard located off the beach about 300-400 yards. The fisherman who uses the nets had his boat out tending to the nets and we slowly made way toward him using him as a navigation aid on how to avoid his nets. Kenny Yergler steers Scarlette toward the southend of some fishing nets off the coast of Torii Beach as Cap'n J stands watch at the bow with camera in hand. The temperature of the air was 70 degrees Farenheit. I tied a thermometer to a string and dropped it in the water. I didn't put a weight on it so it just skimmed across the water. When I pulled the thermometer out of the water it read 72 degrees Farenheit. Anyone still wondering why, I've decided to retire and live in Okinawa? Especially if you're reading this and freezing your rear-end off. Sorry couldn't help but put that out there. Next time I'll need to put a weight on the thermometer as I'm interested in keeping track of the water temperature on our voyages also. No real reason it'll just give the blog more narrative. Torii Beach -- accessible only to people connected to the U.S. Department of Defense -- is one of my favorite beaches in Okinawa. Not because theres throngs of bikini-clad girls. In fact hardly anyone is ever there. That's probably why I like it. It's somewhat secluded but has nice shower facilities, beer on tap, etc. After rounding the nets and motor sailing, the wind started kicking up so we propped the motor and headed north on wind power alone. We made decent time to Cape Zanpa although the Garmin GPS I have said we got there at 11:05 a.m. Just about two hours and twenty minutes of boating time. This was right around low tide but the tide didn't seem to affect our ability to get close to the cliffs at all. There was very little wave action. The lack of waves was key as a friend of mine had said be careful of the waves around there. Helmsman Kenny Yergler leans as Scarlette heels (leans in non-sailor speak) with the wind as we head around Cape Zanpa. As we made our way around Cape Zanpa the wind really started to pickup. Earlier, I had showed Kenny how to keep Scarlette under control when she starts to heel (lean over in non-sailor speak). The green ropes on the bar in front of Kenny in the photo above help cut down on this heeling action. Pull closer to you and you get more sail area to the wind. Let it out and less sail catches the wind. Net affect: pull toward you if you want the boat to lean, let it out when it gets too scary. Apparently the heel by Scarlette was getting a little scary -- especially when you look down across the bow and see only water -- for Kenny and I heard him let out the traveller rope. Cap'n J grabs the boom and "smiles" for the camera with the lighthouse of Cape Zanpa in the background. Once at Cape Zanpa, we posed for photos with the light house in the background. Then moved further up the coast. The north side of the cape is a sheer dropoff underwater. Because of this drop off we were able to get really close to the cliffs without fear of grounding Scarlette. She drafts about five feet of water. We got really close to the cliffs and light house. So close that Kenny kind of started to get a little worried as I tried to get him to shoot one more picture. No, just one more. Uh...we need to tack. We're getting pretty close to those cliffs over there. One of the goals of the trip was to land at a different harbor. On Monday, I spent hours looking at Google Earth and trying to plot the small channel along Maeda Flats. It's an area just south of Maeda Point that is great for scuba diving, but when your keel draft is about five feet below the boat, it can make for an easy grounding. With Kenny at the helm, I spotted the red pole marking the right side of the channel and entrance to Maeda Flats Marina -- I've given it that name until I can get the proper Japanese name. Asked Kenny to point the boat toward the marker and eventually we saw the green pole marking the left-side of the channel. As we got closer to the poles we could see plenty of wave action around the red pole as the waves were smashing against a reef. We cranked up the 5 horse-power Yamaha engine, dropped sails and headed toward the center of those two poles. Kenny moved forward on the bow and helped guided the boat through the channel. He came up with a pretty good hand signal system that helped me know if the water was getting too shallow or how close to the reef we were getting. Had one moment where we got a little outside of the channel in some shallow water but not shallow enough for the keel to ground. The water was incredibly blue -- Carribean-like -- and the channel cut from the reef was pretty easy to guide through. Kenny Yergler enjoys a cup of chili dockside at "Maeda Flats Harbor" after successfully tying off Scarlette on a dock that was ridiculously high. After docking the boat -- scraping the pulpit a little against the high concrete dock -- we headed up to a dive shop to use the bathroom before settling down for a lunch of chilli and saltines I had cooked up that morning for the trip. Was thinking it was going to be colder than it was. Chili still went down good. And the day was nice and sunny -- nearly perfect weather for sailing. Before heading back, I asked Kenny to shoot a couple of pictures within the setting of this harbor. The rocks behind Scarlette in the photo were pretty cool looking. They sit basically in the center of the harbor. It was nice getting pictures of Scarlette in a different location rather than Kadena Marina. Cap'n J stands aboard Scarlette with his best Jack Sparrow pose. While we had made landfall at Maeda Flats Harbor at 1:17 p.m., had lunch, we were anxious to get to Maeda Point the real destination of our trip. We both agreed that visiting the harbor had been a good move as we may need this as an "emergency" port if we get caught up here in bad weather. Having the experience of travelling through that channel in the harbor was good for our sailing skills. Kenny stands on the bow of Scarlette as we exit, "Maeda Flats Harbor". The red pole where the waves are breaking to the left is the "red" marker for the entrance to the channel. As we headed out of the harbor a fishing boat was behind us and was pretty patient. Sometimes the local fisherman starting thinking these small harbors that are publicly built are theirs privately. Gotta remember to bring a case of beer for bribes in case we get any hassle from the locals about stopping at "their" harbor. We again headed north toward Maeda Point. As we started approaching Maeda Point we started to notice a change in wind -- it was dying. Still wearing that Santa Hat, Cap'n J "smiles" for the camera off Maeda Point. Although we were getting close we had to make a decision, try to get all the way to Maeda Point or start turning around and heading home. My cell phone rang and it was my wife wanting to know when we were coming home. "There's no promises in sailing," I told her. She didn't like hearing that at all. So with a new found desire to head home -- remember it is Christmas Eve -- we cranked up the motor as we headed around Cape Zanpa and headed home. Passed close by to some surfers on the way south. One of them waved. Finally someone waved. We had previously tried waving to people on the shore, atop the lighthouse, in other boats, but no one would wave back. This surfer broke that trend. It was funny seeing surfers -- my old hobby -- especially now since I've graduated to boat owning. Had a bear of a time connecting the GPS to my laptop before writing all of this, but finally got it working. Trip to Maeda Point was 19.4 miles. Trip time was 4:01:25 hours. Average speed was 5 mph. Return trip to Kadena Marina was 16.1 miles. Trip time was 4:37:27 hours. Average speed was 3 mph. Landfall at Kadena Marina at 5 p.m. The sun sets on the South China Sea and Scarlette at Kadena Marina. With Scarlette successfully docked at her home port of Kadena Marina we beat feet to the cars and family awaiting time to spend together on Christmas Eve. High tide again was at 4:54 p.m. Sunset was at 5:43 p.m. Spent a lot of time Monday mapping course for Maeda Point trip. Hope it pays off. Will know tomorrow. Trip to meet @8. 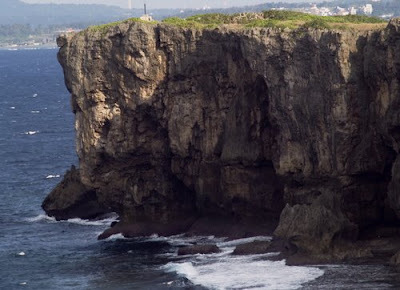 Cast off all lines by 8:30 a.m.
One of the points of interest for the Maeda Point trip will be to pass by the cliffs at Zanpa Mizaki (Cape Zanpa). The Cape is also known as Bolo Point. I'm interested in seeing how close we can get to the cliffs safely. Biggest concerns will be tidal currents in the area. Weather forecast was accurate really windy today. Lots of gusty winds. Morning: Windy, mostly cloudy with isolated rainshowers. Winds from north at 15 knots with gusts up to 25 knots. Afternoon: Windy, mostly cloudy with isolated rainshowers. Winds from north at 15 knots with gusts up to 25 knots. Morning: Very windy with large choppy seas. Small craft advisory. Large short period wind waves. Winds: N 25 to 34 knotsSeas: NNW 12 feet at 8 sec. Afternoon: Very windy with large choppy seas. Small craft advisory. Large short period wind waves.Winds: N 24 to 33 knots Seas: NNW 15 feet at 9 sec. Morning: Gale warning with dangerous seas. Small craft advisory. Use extreme caution. 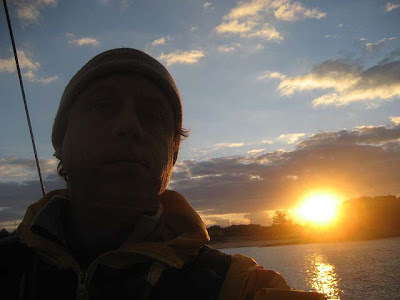 Moderate short period wind waves.Winds: N 26 to 35 knotsSeas: NNW 9 feet at 7 sec. Afternoon: Very windy with large choppy seas. Small craft advisory. Large short period wind waves.Winds: N 21 to 28 knots Seas: NNW 13 feet at 9 sec. Nets arrived today from West Marine. Plan will be put put the nets on Scarlette sometime between now and Dec. 28, 2008. Will have to drill a lot of holes in the toe rails. Would be nice to have proper lifelines. The ones on there now are a little thin. Hopefully, the nets will keep the boys in the boat or at least reduce their chances of becoming a man overboard. The nets were my Christmas present from Tomoe. Boat trailer needs new back wheels. 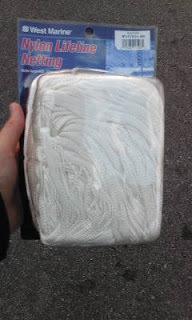 Put new netting on when it arrives from West marine. Plan trip to Maeda point. Dec. 7, 2008 -- On the same day that was supposed to live in infamy, I didn't purposely start out trying to singlehand Scarlette. But, that's how it worked out. The plan was to have three people join me for a three to four hour cruise along the coast of Chatan, Okinawa on the East China Sea. I had been using this as my area to learn how to sail Scarlette -- like a 15-year-old uses an empty mall parking lot to learn how to drive. Although initial plans called for a crew of four, those plans were scuttled when -- by 7 a.m. after waiting from the 5:45 a.m. showtime -- my car was the lone car in the Kadena Marina parking lot. Breezy whitecapping conditions with moderate choppy seas. Moderate short period waves. Winds from North East from 13 to 18 knots. Seas North North West from 9 feet at 9 second interverals. So I rigged up Scarlette and headed South along the Sunabe sea wall. 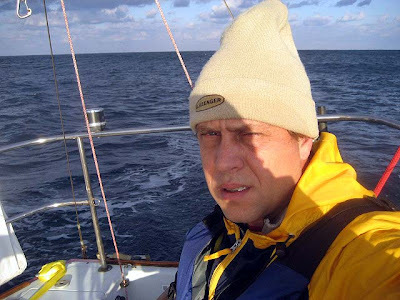 The trip was a real confidence builder for me and showed me how much my sailing skills have improved. I'm ready to single-hand in mild weather, easily.